I had picked up this new Die Version Birdhouse Branch Die and thought I would use it for my main focal point on my card. It's funny, because what I had envisioned in my head came out totally different when I was finished?! Anyone else have that happen? Overall, I am happy with the end result. I definitely need a little practice with the TH splatter brush, lol! I used beautiful Country Roads papers from The Paper Studio that my friend Lisa sent me. I love this assortment...so pretty! Thanks so much Lisa! I distressed the papers with the DIA and also added a layer of cheesecloth between the layers for some texture. 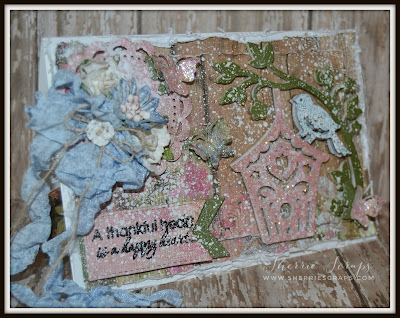 I heat embossed the sentiment from My Creative Time's~A Thankful Heart onto a Ribbon End Banner Die. I used Die Version Birdhouse Branch Die and cut a few layers and then one out of foam for dimension. The added Sparkling Ice Glitter to the house and the adorable birdie is heat embossed with Shabby Blue Embossing Enamel. In the right corner is the Bunch of Stitched Doily Die. The butterflies are the Pretty Butterflies & Dragonfly Dies also sprinkled with Sparkling Ice Glitter. The gorgeous ribbon is the Blues Bundle from DL.ART, the twine from My Craft Spot (no longer in business) and the flowers are from Recollection. The teeny little button in the center is Die Versions Buttons Galore die which is embossed with shabby white enamel embossing powder. I finished with splatters of white acrylic paint applied with the TH splatter brush. Oh my goodness, Sherrie, this is absolutely stunning!! Wow!! I love how you've showcased the DV Birdhouse Branch die!! I've never seen it look so beautiful!! The layers are amazing!! I love the ribbon and flowers and butterflies and sparkle!! What a gorgeous card this is!! Thank you so much for playing along at Scrapy Land and DL.ART!! this card is so lovely and elegant it gives me shivers! Beautiful Sherrie I love the shabby chic look great colors and I always love to see thank you cards as you know. Wowwwwwwwwwww! This is just gorgeous Sherrie!!! I loveeeeeeeeee the colors and all that texture!!!!!!!!!!!!!!!!!!!!!!!! 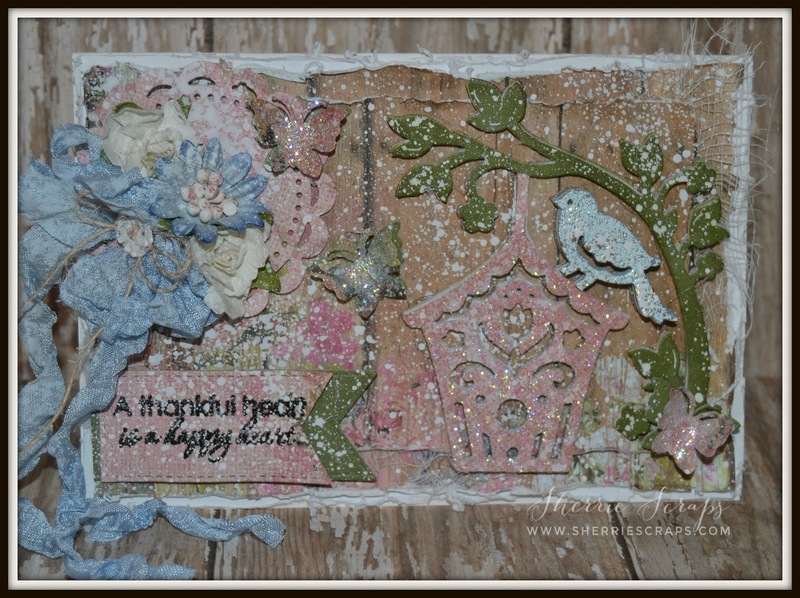 Wow, what a gorgeous piece of shabby deliciousness Sherrie!! WOW!! I am loving the wood panel background. Great take on the "All Lined Up" theme, and it makes the perfect backdrop for your sweet little birdhouse scene! I love the overhanging branch, really adds that extra feel of being inside a summery dream! Thanks so much for joining us at Frilly and Funkie!! 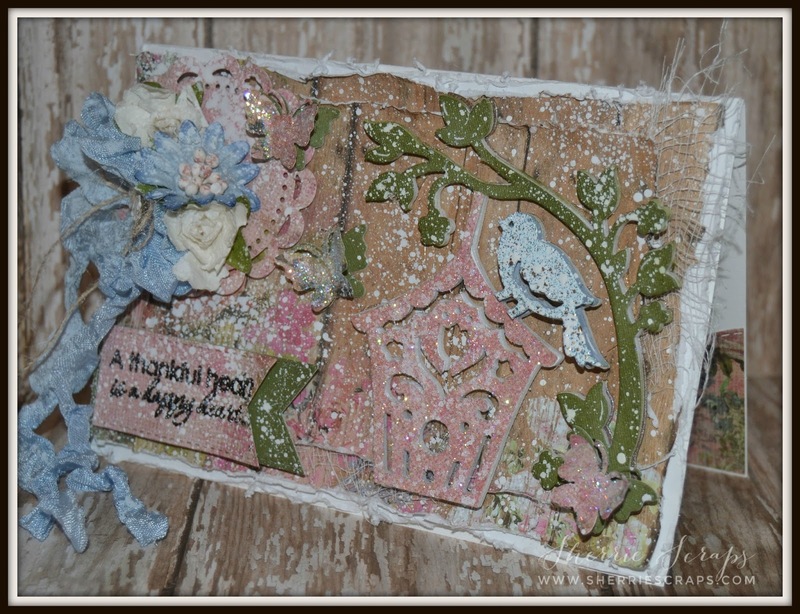 Very pretty card, such a shabby chic design! The papers you used work so beautifully together! That birdhouse is wonderful, love all of the textures you added! So pretty! LOVE the vintage look! Beautiful card! I love that sweet bird house die! The papers you used are gorgeous and I love the soft feeling of your card! Thanks for joining us at DL.ART Thankful Thursday Challenge! This card is gorgeous my friend!!! I absolutely love all the sparkle and texture! 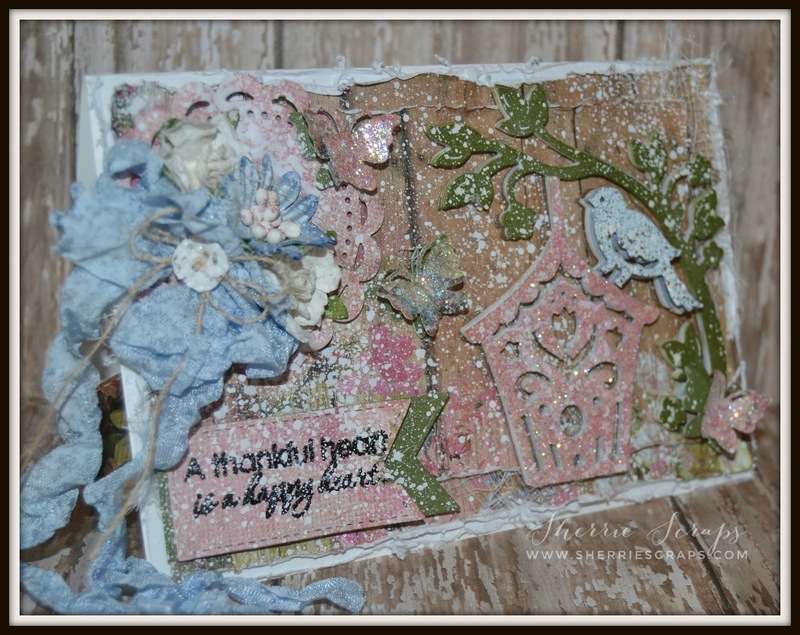 The birdhouse branch die is awesome, maybe something I may need to look into getting myself.... love the texture, cannot say that enough... such a beautiful card!!! I hope you are staying cool and avoiding the heat...and I hope that you are staying busy entertaining the grandbabies! WOW!! This is truly STUNNING! I absolutely love the paper collection and fun textures!I just love the sweet birdhouse and birdie!You know I have to say I absolutely LOVE the GORGEOUS ribbon! !Absolutely BEAUTIFUL my friend!! What a beautiful card, Sherrie! Love the soft colors and all the texture. Thanks for joining us on the Simon Says Stamp Monday Challenge. Wow, this card is beautiful Sherrie. I love the white specks!! Oh my gosh, Sherrie! Your card is so gorgeously shabby. The pastel palette and soft layers are stunning! Thank you for joining us at the Frilly and Funkie Challenge Blog! Amazing, this is so gorgeous! Oh the texture and glitter ice is so amazing! What a terrific card! Your card is gorgeous!! 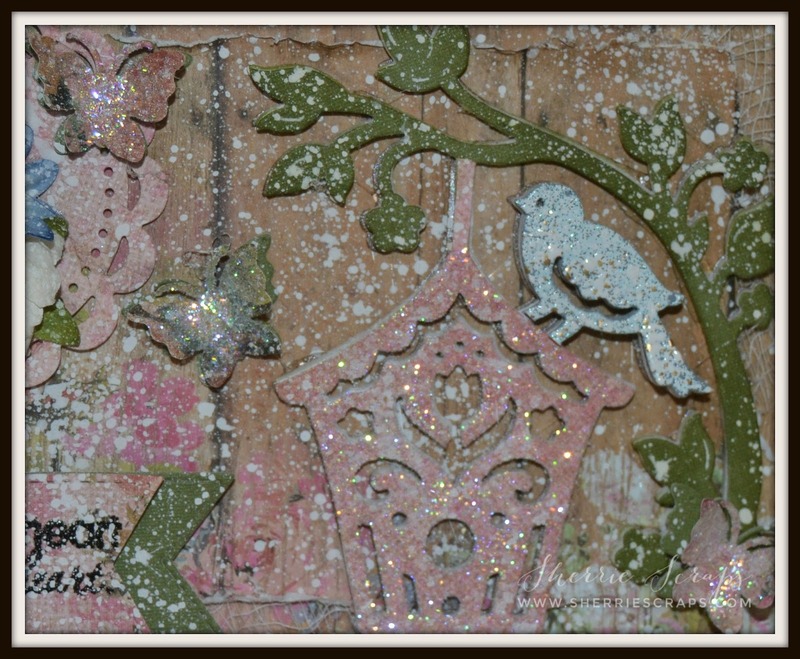 I love the shabby look with the glitter and splatters! It looks like a fun card to make and it turned out so wonderfully well!